Also Known As: “Ball is in the way of the swing; it’s not the target”. This swing thought gets your mind to focus on making sure you continue your swing after impact. 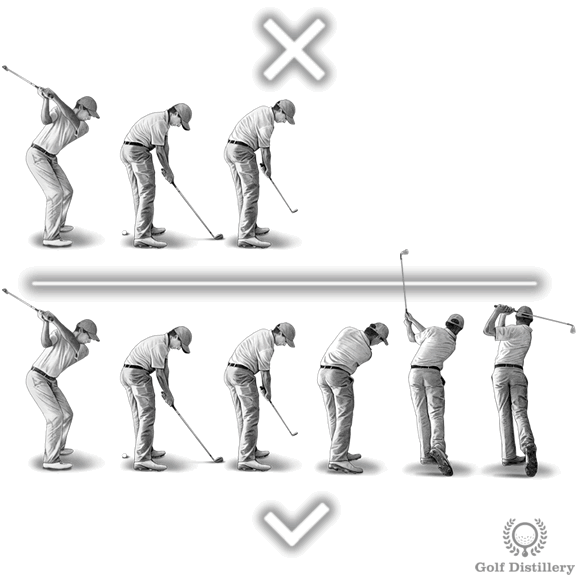 This is in contrast to stopping – more or less – as soon as the club makes contact with the ball. Swinging through the ball will promote a complete swing acceleration towards the moment of impact. Indeed, the objective is to reach maximum club velocity at the moment of impact. It will also make sure your swing is full and that it won’t stop shortly after impact but will rather proceed with a complete follow through. Golfers who see the ball as the ultimate destination will undoubtedly start to decelerate shortly before impact. This happens because your mind has been trained to coordinate – more or less – the end of your swing with the wrongly defined final act – the ball. This kind of swing will result in slapping the ball, instead of striking the ball with the full force generated by your body. The golf swing can be broken into many parts, of which impact is only one component and importantly not the last one. Seeing the act of striking the ball as the ultimate act will result in the follow through being constrained. Indeed, its purpose will be delegated to that of slowing down the club after impact, rather than its full role of promoting the correct positioning of your body into its ideal position. Engraining this swing thought into your entire golf game is recommended. Although there are shots that require you to hold the follow through, it is still recommended that you accelerate into the ball for all shots, including putting. Indeed, not following through during putts will lead to very inconsistent results.